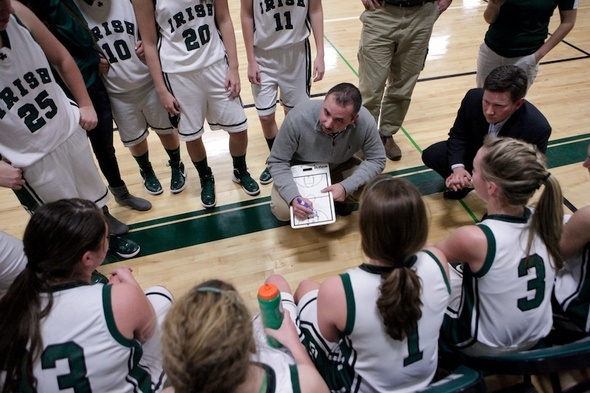 Posted on Thu, Mar 8, 2012 : 5:39 a.m.
Coach Matt Carroll, center, and the Father Gabriel Richard girls basketball team will attempt to win the school's first regional championship since 1993 on Thursday. A lot has changed since the Father Gabriel Richard High School girls basketball team won a Class D state championship in 1993. The school has changed locations and more than doubled its enrollment. The season in which games are played has even changed from fall to winter. Another factor that certainly can’t be discounted, nearly every player on the current team was born after that championship year. Until Tuesday night, one thing remained constant: Gabriel Richard hadn’t won a regional tournament game. Father Gabriel Richard coach Matt Carroll was proud to prove prognosticators (one in particular) wrong with a 37-30 win over No. 9-ranked Chelsea in the district final. The Fighting Irish proved the win wasn’t a fluke by beating Eaton Rapids, another team which flirted with a top-10 ranking all year, to advance to Thursday’s 7 p.m. final against Marshall at Eaton Rapids High School. Carroll often emphasizes the number 40. If his team can hold its opponents under 40 points, he likes its chances of winning. Same if the Irish score more than 40. This year, the philosophy has been spot on as the Fighting Irish are 13-1 when scoring more than 40 points and 4-5 when giving up 40 points or more. Marshall (18-5) has been held under 40 points just twice in its last 14 contests and Gabriel Richard (17-7), though winning it last two games, hasn’t scored more than 40 either time. Carroll isn’t as worried about the latter. Gabriel Richard’s focus against Eaton Rapids was clear: stop Ali Dittmer who averaged more than 20 points during the season. The Irish held her to 16 on Tuesday. Marshall (18-5) is a more balanced team. Katie Slaght is averaging 11.3 points in the playoffs, but three other players have reached double digits in that span. Carroll likes what he’s seen in the first quarter out of his team offensively since the playoffs began, averaging 13.3 points, and partly blames himself for the 9.5 point average in quarters two through four. In the final ‘Beat Pete’ contest of the year last week, no one was able to best my 7-1 picks record. The one pick I missed was not picking Gabriel Richard to win its district. Appropriately, it is the Father Gabriel Richard High School booster club that won the final $150 donation of the year courtesy of AnnArbor.com as a result of Mark Piepsney’s participation winning of our random drawing. Thank you to everyone who participated throughout the season.